Why describe participation in outdoor recreation? Sound planning requires a strong foundation of information. Quantifying the desire for and availability of recreational trails helps build that foundation for decision making among trail providers in the Flagstaff region by providing one piece of the puzzle – what types of trail activities do residents and visitors enjoy in Coconino County? How many people participate and how frequently do they do so? This information – when combined with strong community engagement – allows providers, users and other interests to make more informed decisions about community needs and equitable access in times of scarce resources. The National Park Service Rivers, Trails and Conservation Assistance program, Arizona Field Office prepared this document in support of the Flagstaff Trails Initiative (FTI), a collaborative effort that seeks to improve the quality, connectivity and community support for a sustainable trail system. More information about the Initiative can be found here: http://flagstafftrailsinitiative.org/. It is subject to revision as new data becomes available. Over 58% of Coconino County residents report participating in non-motorized trail activities, including hiking, backpacking, mountain biking, and horseback riding at least once each year. Hiking is the most popular trail activity. County residents hike at a rate substantially higher than the national average. Over 53% of residents report hiking in the past year; it accounts for more than half of all “trail days” (55% of the total) generated by County residents each year. “Trail days” are defined as each day spent engaging in a trail activity by single individual over the course of one year. Over 20% of County residents participate in motorized trail activities, including driving a 4×4 vehicle, side-by-side, dirt bike or quad/ATV riding each year. The vast majority of motorized users also participate in non-motorized activities. County residents participate in equestrian and motorized activities at a rate close to the national average. County residents generate approximately 2.2 million “trail days” per year based on participation frequency. Over 40% of County residents do not utilize recreational trails. Flagstaff visitors report using hiking and walking trails at a rate (56%) higher than any other attraction. Flagstaff has higher rates of visitors using hiking trails than either Prescott (40%) or Verde Valley (43%), both of which are well-known outdoor destinations. Flagstaff visitors likely use area trails more than residents. A majority of Flagstaff visitors report participating in a trail activity during their visit. These participation rates would translate into between 2 and 3 million non-resident “trail days”. 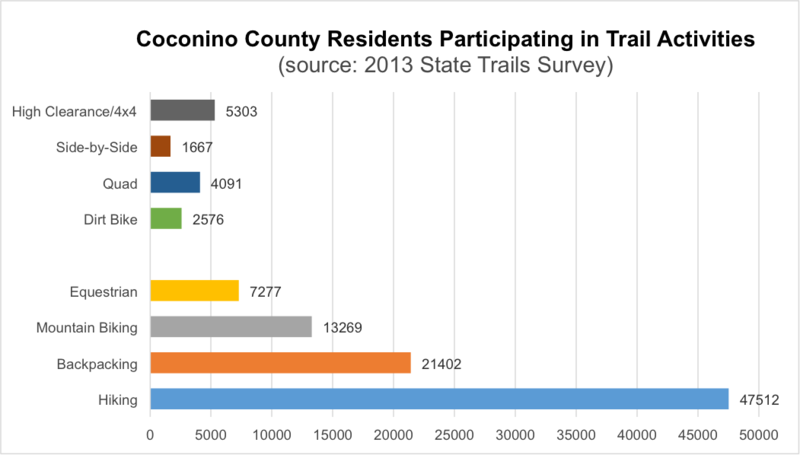 Several sources of information were analyzed to develop this report, which serves as an informed “best guess” of participation in different trail activities among residents of, and visitors to, Coconino County. It should be noted that none of these data sources are specific to the Flagstaff Metropolitan Planning Organization boundary, the identified planning area for FTI. Trail activities reported by residents and visitors and captured by these surveys may take place outside this planning area. Also, each survey or information source has biases that stem from methodology, timing and other factors. This survey-based information should be combined with on-site counts as they become available to provide a more complete picture. During your time in Arizona, have you ever used any trail for motorized recreation? During your time in Arizona, have you ever used any trail for non-motorized recreation? Respondents were able to answer in the affirmative for both motorized and non-motorized participation. For example, nearly 90% of motorized users reporting participating in non-motorized activities as well. Based on these answers, participants who answered affirmatively for each broad activity type were then asked to comment on which motorized or non-motorized trail activities they participated in and how frequently. 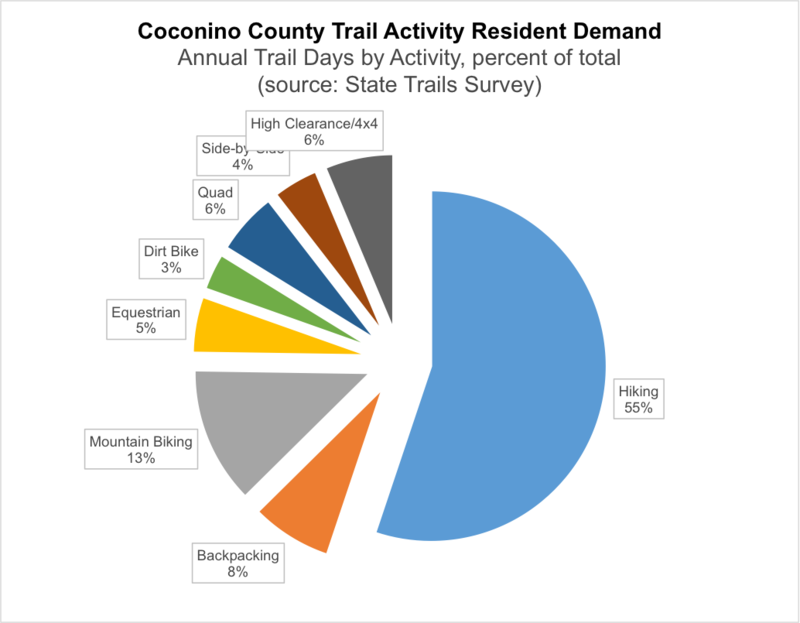 Using these response rates, it’s possible to estimate Coconino County participation in several trail activities and generate an estimate of residents participating in each activity and the number of total “trail days” for each use type. The estimated population of Coconino County is approximately 139,000, as of 2015. The self-reported frequency of participation varies between activities. For example, those who report dirt bike riding report doing so on average 29 times per year, whereas backpackers report taking 8 trips per year on average. It should be noted that “trail days”, even if they originate within Coconino County, may take place outside of the county. 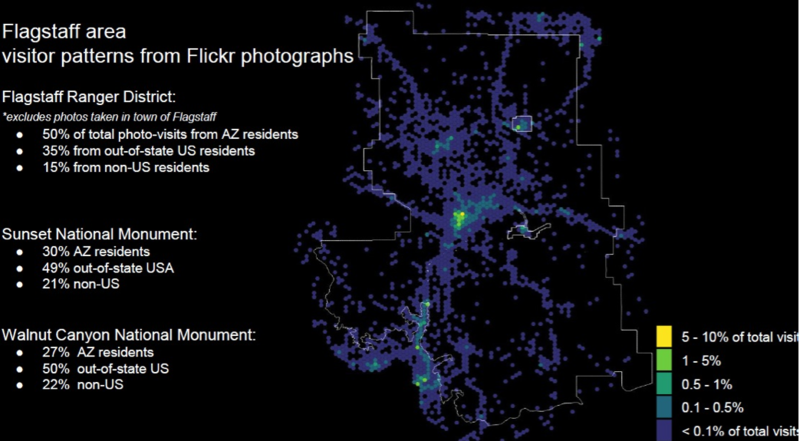 How does the Flagstaff area compare to the national picture? The US Forest Service Southern Research Station conducts a nationwide estimate on national rates of participation in various recreation activities. The most recent data set is from 2009 and captured in Outdoor recreation trends and futures: a technical document supporting the Forest Service 2010 RPA Assessment. The conclusions in the technical document are based primarily on the National Survey on Recreation and the Environment (NSRE). The NSRE is a telephone survey of US residents age 16 and older. One of the purposes of the survey is to measure participation in nature-based recreation activities. The survey includes an assessment of numerous forms of recreation. The three activities relevant to the Flagstaff Trails Initiative are outlined below. Note that mountain biking and backpacking were not included as response options. Using a variety of analytical methods, the report also predicated the popularity of these activities in 2030. A comparison of the Arizona State Parks data and the national US Forest Service data indicates that Coconino County residents participate in motorized activities and horseback riding at a rate near the national average, but participate in trail hiking substantially more frequently than other US residents. What about Flagstaff visitors? Where are they coming from and do they participate in trail activities? Out-of-town visitors make up a large portion of recreational trail users in and around Flagstaff. The Flagstaff Ranger District of the Coconino National Forest summarized trail register information at several popular trails in the area between 2004 and 2014. An analysis of geotagged posts on the social media website Flickr was completed using the Natural Capital Project’s Tourism and Recreation model. The analysis indicates out-of-state and international visitors may be underrepresented in trail registers reports, or that a lower proportion of these visitors use trails on the Coconino National Forest. This social media analysis concludes that 35% of photos are taken by out-of-state visitors and another 15% are from international visitors. In 2015, the Flagstaff Convention and Visitors Bureau commissioned a study of visitors of the Flagstaff area. Researchers at the Northern Arizona Hospitality Research and Resource Center conducted an intercept survey over a period from 12 months (February 2014 to January 2015) that generated 1,730 completed responses. 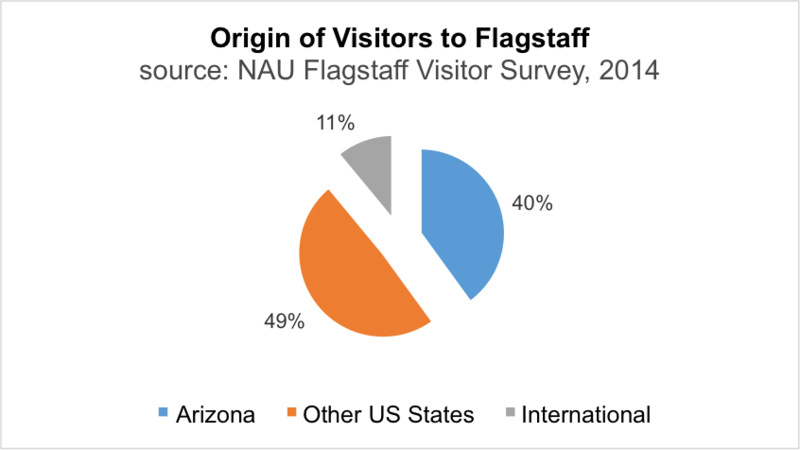 This survey supports the conclusion that Flagstaff visitors come from across the US and the globe, often enjoy outdoor activities during their stay. Flagstaff compares favorably with other Arizona destinations in terms of visitor participation in outdoor recreation. Flagstaff has higher rates of visitors using hiking trails (56%) than either Prescott (40%) or Verde Valley (43%), both of which are well-known outdoor destinations. Visitor bicycling rates in Flagstaff are comparable with Sedona (both at 5%) but lower than Prescott (8%). Rates of wildlife viewing and birdwatching – activities that frequently utilize trails – were comparable in the three destinations. Flagstaff offers 10% of the state’s overnight accommodations. These facilities host approximately 4 million visitors a year. Using the Flagstaff Visitor Survey participation rates, this translates into between 2 and 3 million annual non-resident “trail days”. What trail activities are popular on the Coconino National Forest? The US Forest Service National Visitor Use Monitoring (NVUM) program is a nationwide effort to estimate visitor use of national forest lands and characterize visitation in terms of activity participation, demographics and other descriptive information. The most recent report for the Coconino National Forest was released in 2015. It’s important to note that the report covers the entire Coconino National Forest, not just the Flagstaff Trails Initiative planning area. This survey question likely underrepresents participation in certain activities, especially motorized recreation. The survey contained a related question of what facilities are utilized by visitors to the Coconino National Forest. 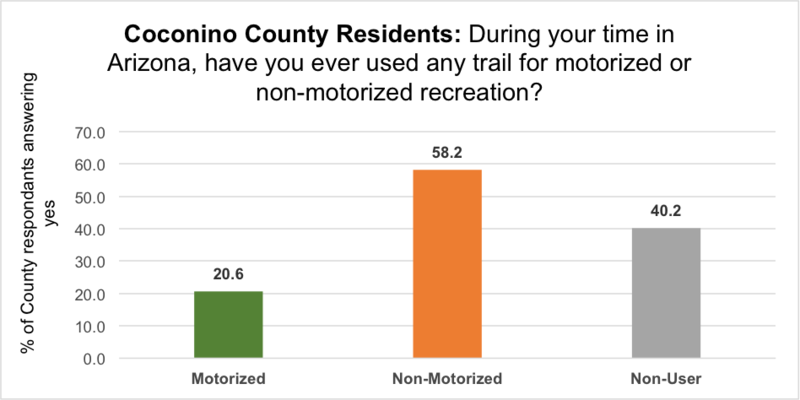 Over 14% reported using some type of facility dedicated to motorized recreation (designated off road vehicle area, motorized single track trails, or motorized dual track trails) indicated they participated in a motorized trail activity during their visit.